WATERLOO, ONTARIO--(May 30, 2012) – P&P Optica Inc., a world leader in the development of high performance spectrometers, reveals their newest hyperspectral multichannel spectrometer that utilizes in-house developed and manufactured PPO Gel Gratings. This groundbreaking technology delivers fundamental advancements for a diverse range of applications. P&P Optica's high performance non-scanning spectrometers with PPO Gel Grating technology allows for the acquisition of high spectral resolution hyperspectral images without the use of filters. The company's multichannel spectrometers can simultaneously monitor over 200 separate channels registered using a single spectrometer with each channel able to resolve up to 1000 separate spectral points. 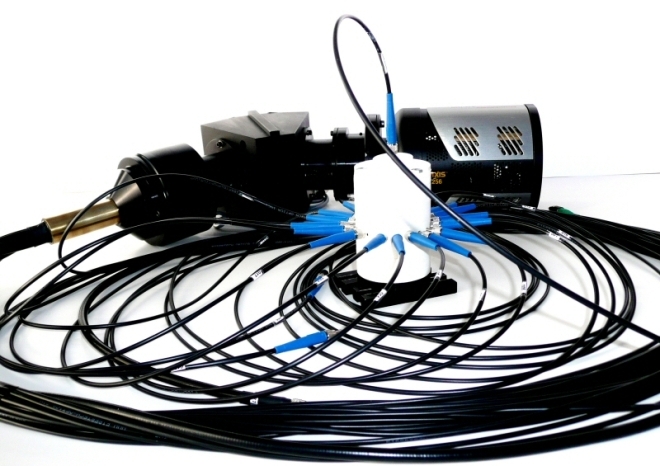 Combing the two technologies has resulted in the PPO HyperChannel Spectrometer, the patented design can distinguish over 200 separate spatial points arranged in any configuration. The groundbreaking spectrometer is exceptional at quickly acquiring high spectral resolution hyperspectral data sets as all spectral and spatial data is collected in a single exposure. The PPO HyperChannel Spectrometer is available for purchase as a standalone product, or bundled with P&P Optica's line of spectroscopy products, including the company's newly released advanced spectroscopic data analysis and acquisition software suite, Iris. P&P Optica specializes in high performance spectroscopy systems. These systems are based on the Company's high efficiency holographic gel transmission gratings and design optics, which when combined enable a line of spectroscopy products that provide the highest efficiency and lowest distortion available in the market today. P&P Optica's spectrometers allow customers to measure very small concentrations of substances, significantly lower than other available systems on the market today, due to the much higher quality spectra.